On the timeline known as Britannica-6, the 19th century is a time of great inventions and huge engineering projects – but this isn't the Victorian Age! Queen Victoria was never born, and the Georgian period never ended. Royal "Bloods" and outrageous dandies gamble fortunes on aerostat races and sponsor gigantic war machines, while Luddites grumble and the secret agents scheme. 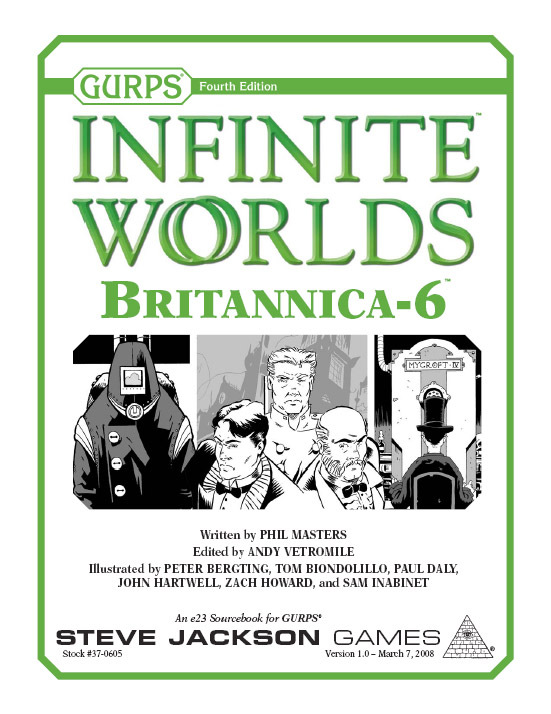 Agents of Infinity must plunge into this ferment of wild engineering and aristocratic excess, struggling to distinguish the razor-edged politics of the Blood Games from Centrum plots and Swagman scams. Or you can play a "locals" campaign, serving a Blood faction, radical ideals, or the interests of all Britannica. This supplement also includes a sample scenario, "The Decorations on the Channel Bridge," featuring murder, mystery, and especially excessive engineering. So ready your Grey Maggie rifle, fire up your motor-phaeton, gamble your fortune on a turn of the cards – but whatever you do, beware the Electrical Terror! 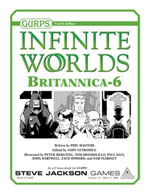 GURPS Infinite Worlds: Britannica-6 is a world book for use with the GURPS Infinite Worlds setting, or for any campaign seeking High Adventure in a Steampunk world not quite like our own.